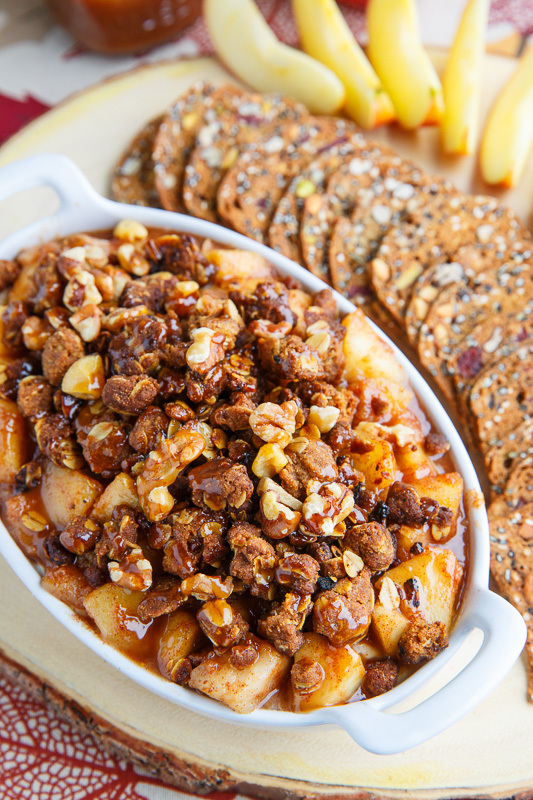 Caramel apple crumble served on top of a cheesecake layer as a dip! 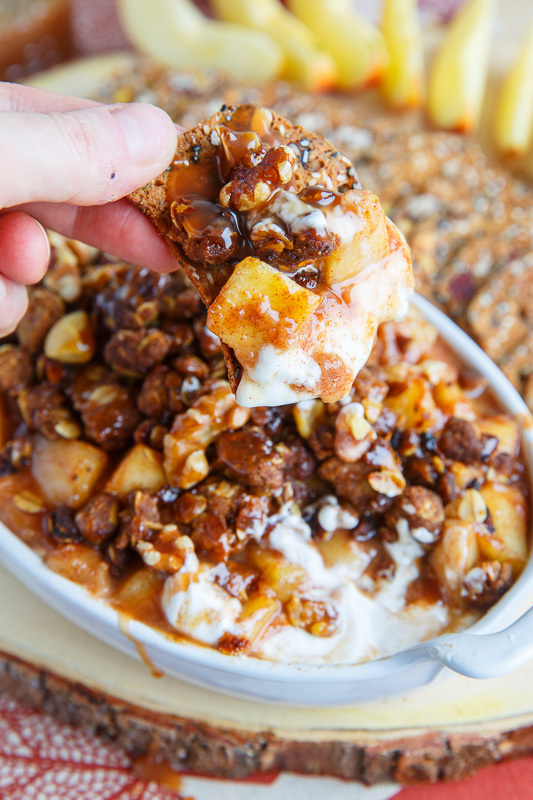 The other day I was thinking about ideas for snacking over the holidays and somehow I arrived at the idea for this caramel apple crumble cheesecake dip. 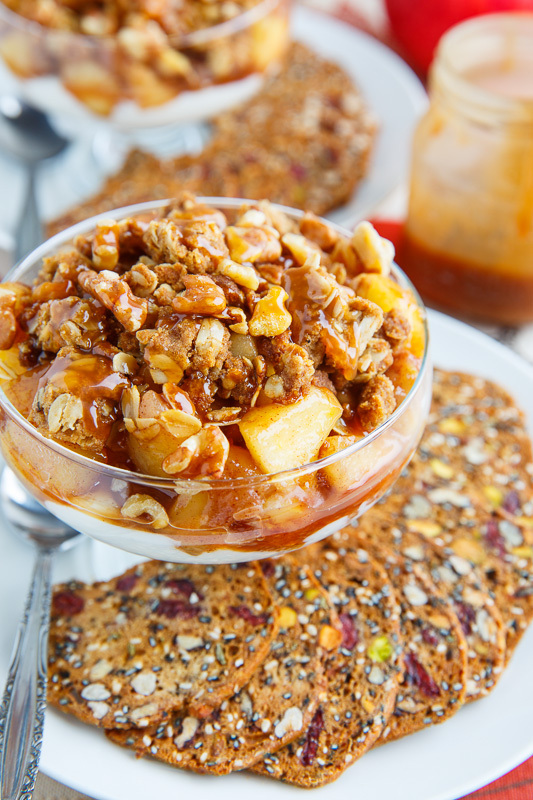 I guess I was thinking of seasonal dishes like apple crumble and somehow that led to the idea of an apple crumble dip. Most of my favourite dips involve plenty of cheese so I could not help but think about how to incorporate some and at once it seemed obvious, a creamcheese cheesecake layer! I started out with a simple no-bake style cheesecake with cream cheese and instead of whipped cream I went with greek yogurt and I used caramel sauce as the sweetener. Next up was the apple layer which is simply some diced apples that are cooked until just tender and then smothered in caramel sauce along with a hint of cinnamon and nutmeg. The crumble layer is pretty easy, consisting of the usual suspects, butter, sugar, flour and cinnamon and once you get that all mixed up you bake it until lightly golden brown and crispy. 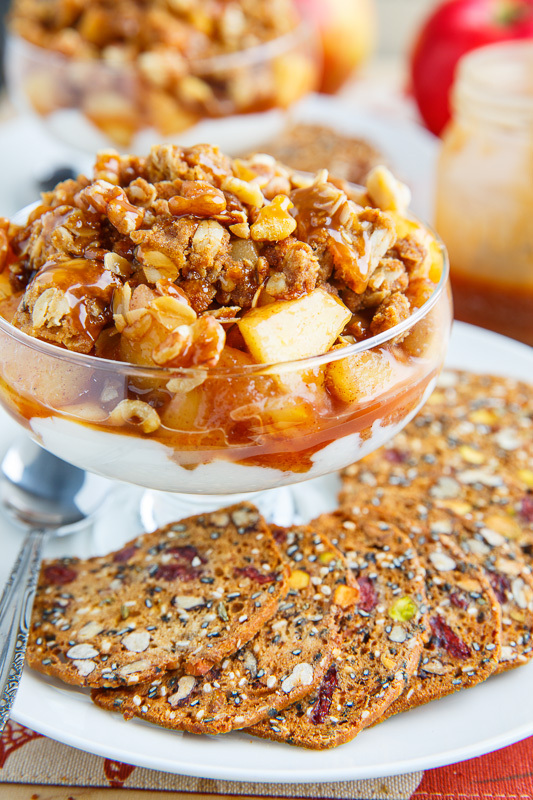 So the final dish is a caramel apple sauce on top of a creamcheese/cheesecake layer that is served with cracker as a dip but you could also just eat it by the spoonful! A hidden creamy cheesecake Layer! Feel free to serve it in one large serving dish or smaller even individually sized dishes! 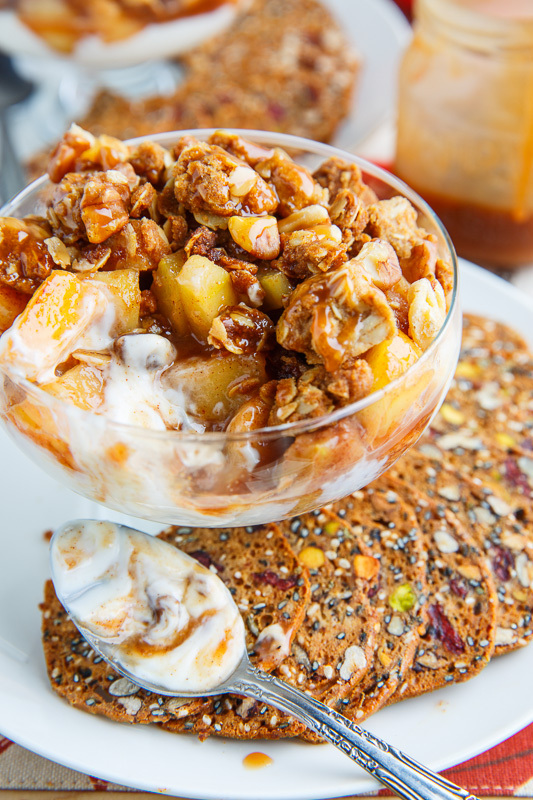 Melt the butter in a pan over medium heat, add the apples and cook until just tender, about5-8 minutes. Mix everything until it forms small chunks, spread them out in a single layer on a baking sheet and bake in a preheated 350F/180C over until lightly golden brown, about 6-10 minutes, mixing a few times in between. 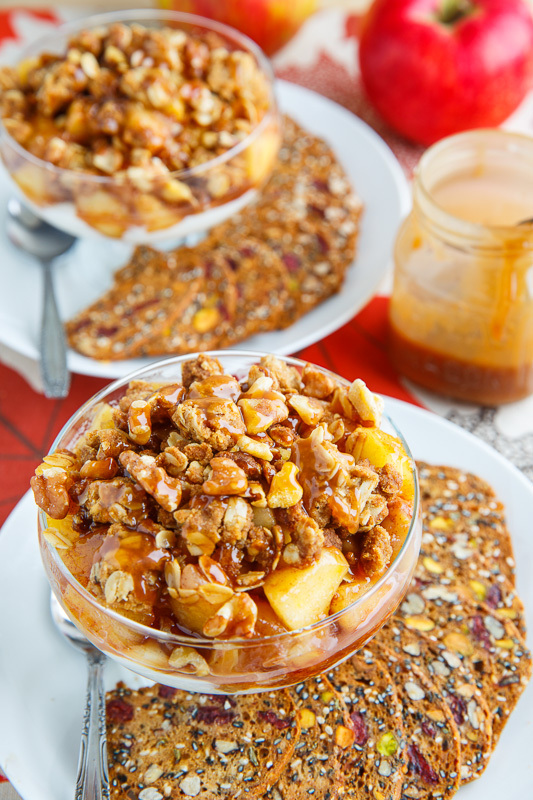 Place the cheesecake mixture in the bottom of the serving dish(es), top with the caramel apples, the crumbs, walnuts and the caramel sauce and enjoy by the spoonful or on crackers, etc. This one looks amazingly delicious. 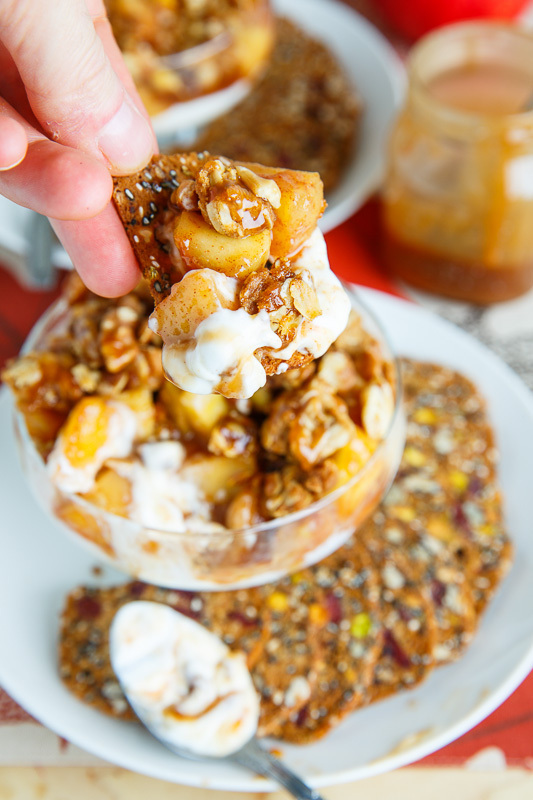 Do you think that it will taste good if I replace the brown sugar with coconut sugar and the caramel sauce with dark agave syrup? Great idea for a dip! What kind of crackers are in the pictures? Oh this!!! So great Kevin! Yes, I also, would like to know which crackers are shown with the dip, which also looks scrumptious!!! Oscar Humphries: Coconut sugar would be great and I am not sure about the dark agave as I have not really used it. Alane & Debbie Br: They are Cranberry and Fennel crackers by Presidents Choice. I would be eating this like crazy!! Wow, that is an amazing dip! Angie Miller: They are store bought but they are really good and I am tempted to try to make a recipe for them! Tried that last night and was quite delighted! Never thought that mixing apples with cheese will be so delicious. Next time I'm thinking of replacing the apples with pineapples. I hope this won't ruin the exquisite taste of this recipe.